What cozy, warm place is complete without furniture? Furnish your kiln space with these handy space makers! You'll often hear shelves (and posts) referred to as "Kiln Furniture". 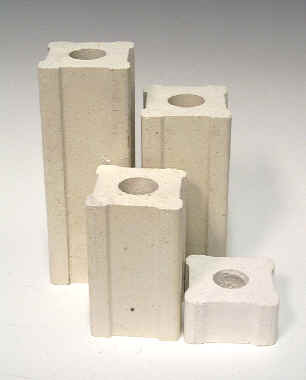 These items are needed to support and separate the ware during a firing. The use of kiln furniture is a must. 5.5" x 5.5" x 5/8"
7" x 7" x 5/8"
12" x 12" x 5/8"
18" x 21" x 5/8"
Use kiln posts with drop molds, to elevate slumping molds preventing entrapped air, to vent heat by propping the kiln lid open, or to elevate kiln shelves off the floor of the kiln. To find shelf paper and mold release, click here!